During the Great Depression Franklin D. Roosevelt created the Work’s Progress Administration (WPA) in hopes of creating jobs for Americans. Over 8,500,000 Americans were hired through the WPA mostly to work in manual labor building roads and making park. Unemployed artists and writer’s were given work through a branch of the WPA known as the Federal Writers’ Project. The most well known works from the Federal Writers’ Project was know as the American Guide Series which contained the histories and points of interest of each state in the union. 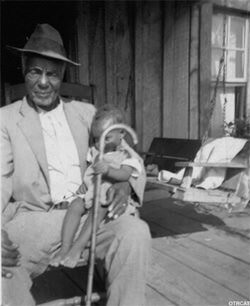 Another gem of the Federal Writers’ Project is the oral histories’ project in which over 10,000 Americans from all walks of life were interviewed including former African-American slaves. Some of the authors of the Federal Writers’ Project include Zora Neale Huston, Richard Wright, Saul Bellow, Claude McKay, Nelson Algren, Maxwell Bodenheim, Loren Eisley, Vardis Fisher, Weldon Kees, and many others. Acclaimed author Ralph Ellison was one of the interviews of the oral history project and admits that the slave narratives greatly affected his character study in the novel, The Invisible Man. This collection includes interviews with seven former slaves as well as transcripts and photographic portraits. The compelling interviews give the listener a taste of life as a slave as well as reveal the attitudes and beliefs of each individual. Some interviewees sing songs, tell stories of encounters with ghosts, and general life before and after the 13th Amendment. For inspiring African American stories see : Destination Freedom and for more WPA recordings, see also: WPA Concert Recordings. See also Civil Rights, Racism, Discrimination, and Prejudice in Old Time Radio, KKK in Old Time Radio, Superman Fights the KKK, People Take the Lead, Destination Freedom, Racist Music, Former Slave Interviews, A New World A-Coming, and Minstrel Shows. Be the first to comment on "Former Slave Interviews"